Get out the Vote 2018! - American Women's Club of Berlin e.V. Home » Get out the Vote 2018! 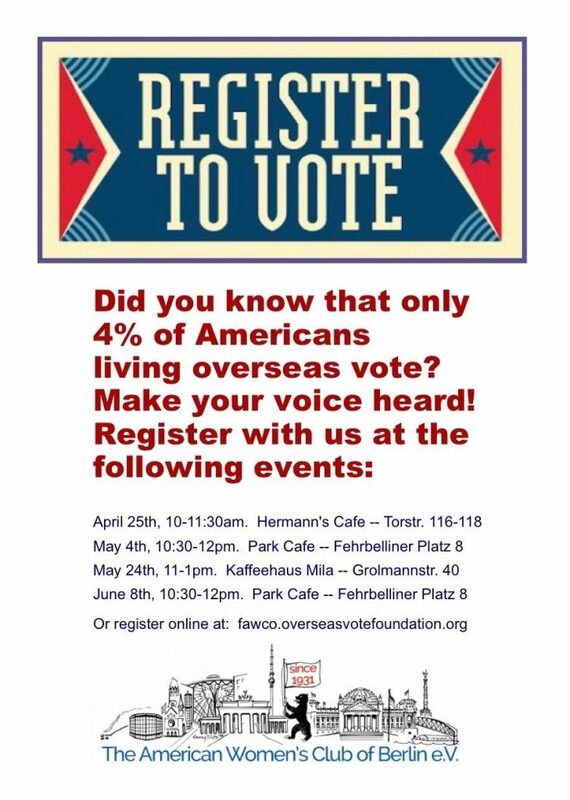 AWC Berlin joins FAWCO (www.fawco.org) to Get out the Vote in 2018. Did you know that out of 8 million US citizens living overseas (and 2,8 million eligible voters), there were only 97,000 ballots sent in in the last Presidential election? That’s less than 4% of eligible voters. In downballot elections, the number is even much lower. The 2018 United States elections will be held on Tuesday, November 6, 2018. All 435 seats in the United States House of Representatives and 35 of the 100 seats in the United States Senate will be contested. 39 state and territorial governorships and numerous other state and local elections will also be contested.